Woo Hooo!!!! I never thought in a million years I would get back to this paradise so soon but here we go again!! Thank you so much Ek for arranging to come here during my last few days of the journey for some serious R and R and reflecting time following a whirlwind adventure! I promise Liz I will bring you back a piece of Phuket!!! I promise!!! My daughter didn’t want to leave this place in 2008 and I don’t blame her. We are staying in this same stunning hotel with rooms that walk out into the pool!!! Above is my daughter Liz picking our our dinner. 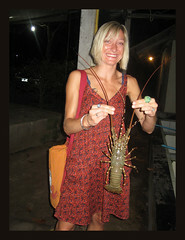 The best seafood on the planet is at this little restaurant on Phuket. The oysters on Ek and Pais plate were immense!!! We ate so much I thought we were going to burst! 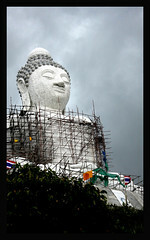 I wonder if they finished building this giant Buddha on Phuket? 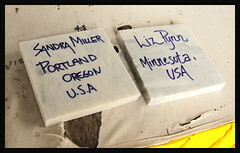 I bought 2 marble tiles with Liz and my names on them that were to be installed in the Buddha. 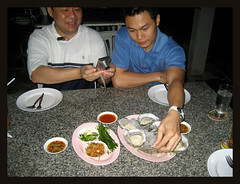 BELOW IS A VIDEO I MADE OF OUR LAST TRIP TO PHUKET IN 2008. Phuket (??????) , pronounced (roughly) “poo-get”, is Thailand‘s largest island. It is 48 km in length, 21 km at its widest, and is in Southern Thailand, on the west-facing Andaman Sea coastline, suspended from the southern tip of Phang Nga Province by a pair of short but substantial road bridges. Only a few of Phuket’s cities are not on the beach. Phuket Town – The administrative center of the province, and the island’s main population center. Has the cheapest accommodation, but no beaches. Ko Bon — 10 minutes from Rawai, an ideal island for a day of snorkeling and relaxing. Ko Hae (Coral Island) — 15 minutes by speedboat from Chalong Bay, accessible all year. Ko Racha (Ko Raya) — consists of two islands (Yai and Noi), popular with scuba divers and a relaxing snorkeling destination. Phuket formerly derived its wealth from tin and rubber, and enjoyed a rich and colourful history. The island was on one of the major trading routes between India and China, and was frequently mentioned in foreign trader’s ship logs. In recent times, though, Phuket’s top earner has been tourism, which has transformed the island into Thailand’s wealthiest province. The west coast of Phuket was hit severely by the Indian Ocean tsunami of December 2004, but almost no evidence of the damage now remains. Phuket is a melting pot of Buddhists, Thai-Chinese, Muslims and even sea gypsies. The majority of the population in the rural areas is Muslim. Outside of the provincial town, the rural folk speak with a thick Southern dialect which is difficult for even other Thais to understand. The provincial town’s economy having boomed over the past decade has lead to a lot of the youngsters leading similar lives to those in Bangkok. Altogether, the lifestyle of the urban Thai-Chinese resembles that of Bangkokians.